Mevlüt Çavuşoğlu isn’t a name that is instantly recognisable, neither in his native Turkey nor the many countries he represents across Europe. His job title – President of the Parliamentary Assembly of the Council of Europe – is a bit of a mouthful, but it’s an influential role in an institution that keeps itself busy, even if doesn’t have the greatest amount of clout. Earlier this evening, following a lecture at the London School of Economics, I asked Mr Çavuşoğlu what his ambitions were. Surely after eight years in the Council of Europe, a man of his experience and skills has ambitions back home? “This is the first time I’m saying this publicly,” he said, “but once my term comes to an end I intend to return to Turkey.” That would be an unusual move for his role: presidents of the assembly are permitted to stand for re-election three times, and most of his predecessors have done so. But Mr Çavuşoğlu is cutting his time is Strasbourg short to go back to Turkey, and that’s significant for two reasons. Firstly, he’s built a reputation for himself abroad. Serving as one of Turkey’s 12 representatives on the assembly since 2003, he was elected president just over a year ago. It was hailed as a triumph for Turkey’s rising diplomatic prowess, nicely complementing the country’s Security Council seat and the Turkish secretary-general of the Organisation of Islamic Conference. “A very shrewd political operator,” an enthusiastic commentator wrote in Today’s Zaman at the time, adding: “he will have to take positions which may not always be welcomed in Turkey”. Much of his work is subtle. “My number one priority,” he said, “is improving parliamentary diplomacy among Council of Europe member states.” That means meeting junior members of parliament in places like Armenia and Moldova and getting them to speak to their counterparts in other parliaments. It’s not quite headline-grabbing material; it’s about spreading democratic values, but it also means he will be recognisable to the next generation of European leaders. Clever, if it works. 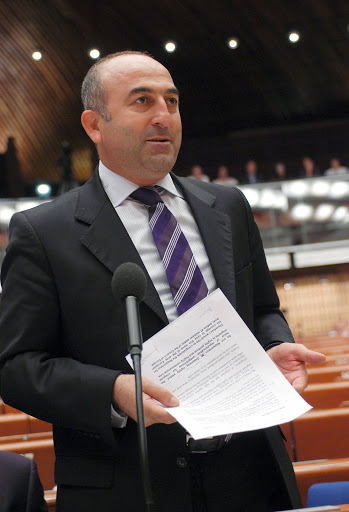 The subtlety extends to Turkish politics too: Mr Çavuşoğlu is a founding member of the ruling Justice and Development (AK) Party, and was reportedly not offered a place in the cabinet two years ago purely because of his Council of Europe ambitions. But his distance from home doesn’t stop him commenting on it: this evening he was openly critical of the 10 percent electoral threshold that his own government won’t lower, and said there was much more to do in Turkey’s handling of its Romani community. In response to persistent questioning from William Horsley, of the Association of European Journalists, he was extremely defensive of the AK government’s record on press freedom, claiming not a single journalist had recently been jailed in Turkey “because of freedom of expression”. A doubtful claim, but he was confident enough to make it. This leads to the second reason why Mr Çavuşoğlu’s return home is significant: he hinted very heavily at pastures new. At this evening’s talk, I raised the example of the cabinet which, despite the presence of heavyweights like Ahmet Davutoğlu, foreign minister, is rather bereft when it comes to international experience. Many members of the cabinet, including the prime minister, speak little English. If, when his term ends in eleven months’ time, he truly doesn’t run for re-election, it will be a rather different Turkey he returns to. The 2011 election will be out of the way, and a fresh AK government will be in power. The question of President Abdullah Gül’s term in office – either five years, ending in 2012, or a single term of seven years – will have finally been settled. We will also know whether Recep Tayyip Erdoğan, prime minister, who has already said he won’t be leading his party at the end of its next term in government, will attempt a rise to the presidency. Mr Çavuşoğlu won’t yet have the gravitas at home necessary to contest a party leadership contest to replace Mr Erdoğan, but he could be the man from whom to seek support. He could easily be a future foreign minister, handed the reins of Turkey’s new “zero problems” policy. “I don’t know what I will do,” he said. “It’s not always for me to choose.” Then he grinned broadly. Not the mimics of a man dreaming of an early retirement. This man is one to watch.